Emma's teacher has been overwhelmed by our kindness and generosity. Today, in addition to her gift, I wrote her a note to let her know how very blessed we are that she is Emma's teacher. I love her teaching philosophy and wanted to be sure she knew just how much she's appreciated by me and Henry. Here are the little goodies she received today. 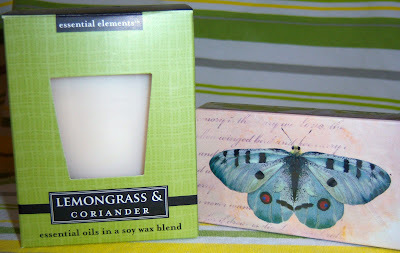 A candle and in the butterfly box are matches. 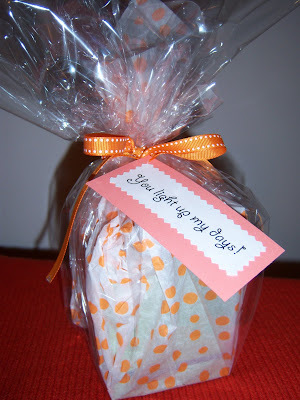 A clever little gift tag. The candle cost $5.99 and the matches were $.50. 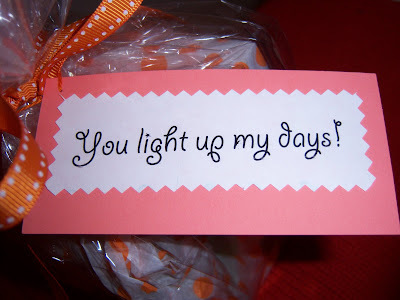 I had the clear wrap, tissue paper, ribbon and card stock. I printed the tag using my printer. Simple yet pretty!